Baling twine is a type of synthetic twine that is usually used to bind together hay or straw. It is coarse and rough, much like a very thin piece of rope, and can usually hold a weight of up to 350 lbs. Baling twine has many uses, including craft-making. Crochet baling twine to make a door mat or rug. The rough material is just the thing to wipe off dirty boots or shoes, but still looks cute with its earthy, neutral color that matches anything. If you want a pop of color, mix in a little bit of colored rope, yarn or twine to add design and interest. Baling twine can also be made into a basket using crochet techniques. Baling twine is strong enough to make a relatively durable, yet inexpensive basket for decorative purposes or for potted plants. To make an earthy, rope-like belt, weave or braid some baling twine to the length you need. You can make it one neutral color if you use baling twine alone, or you can add some color or a pattern by mixing in colored twine, yarn, rope or other materials. Instead of buying steel wool pads or netted sponges to scrub out hard-to-clean pots and pans, recycle used baling twine and weave it together to make your own pot scouring pad. 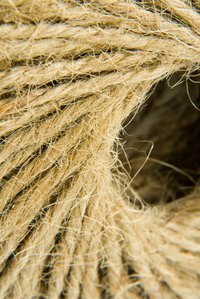 The rough texture of the woven baling twine is similar to that of steel wool, which makes it great for scraping off dried and hardened bits of food. If you have a lot of excess baling twine lying around that you don't have use for, make a hammock out of it. Weave the baling twine to form both the supports and the body of the hammock. Alternatively, use old blankets for the body of the hammock and weave baling twine together to create the support structure. Because baling twine is strong and coarse it doesn't wear out easily, making it a fine material to use to tie a hammock to a tree.